Our friend Breezer runs the website Meetidea.com and is passionate about finding awesome products with a real WOW factor. Here is a great pick he found just for you guys! It is Friday 13:00hrs. On calm and peaceful afternoons like this one, I normally have a laptop in place. Ready to type my thoughts away. Today, one particular piece of unique ‘furniture’has me mesmerized. Ideally, it is not supposed to be regarded as a piece of furniture, no. It should be just a mere tool to be used by cats specifically for ‘waste’disposal. But the way it is made, how it looks and how well it serves its purpose commands respect. I came to my elder sister’s home a few days ago. I always look forward to my city visits. It’s ever fun to find out what she brings home from her around-the-world travels. (She’s an airhostess). This time round, I noticed an igloo-looking piece that wasn’t there before the last time I came visiting. A cat litter box for her cat Missy. 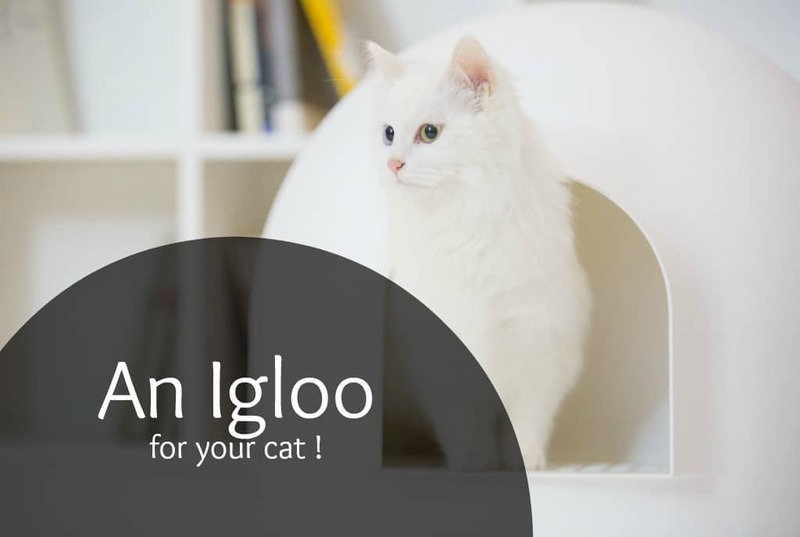 You might wonder, what’s special about a damn Igloo cat litter box? Isn’t it just something you order online and have it delivered? Well no, for a couple of reasons. You can’t order something you never knew existed in the first place, right? Where I come from (the countryside), most people just have an old basin, a box or any usable open container filled with soil or fine gravel, to serve as a litter box. It is then hidden in a corner somewhere in the house. Preferably a place where visitors won’t pay witness to the mess. 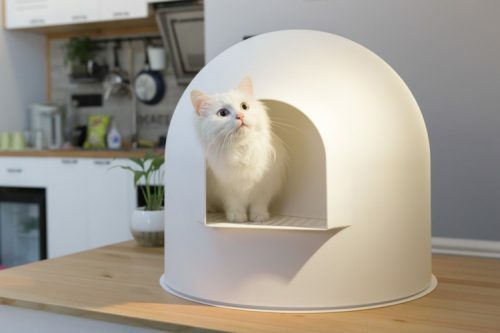 The igloo cat litter box resembles the Eskimo (Inuit) Igloo homes. This design complements the interior décor. In fact, at first glance it would not occur to you it is just a litter box. The one in my sister’s living room is white in color. It blends so well with the black and white color theme in the house. It seems to be some sort of an art piece for decoration. So elegant. The dome round shape allows enough room for Missy to turn round with ease while digging. She’s a pretty large cat this one. With the most beautiful white and grey fur color patches. Even when it was a kitten, it was a little too large for a normal kitten size. She weighs 6.75 kilograms at the moment. The design prevents the bad smell from leaking into the living room. You don’t have to hide it in the darkest corner of the house to keep away the stench. Quite conducive in maintaining a fresh air aura. Cats love to go about their business in private. 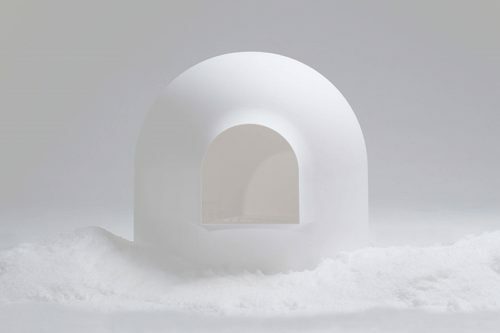 The igloo design ensures that is looked into. The enclosed space is just ideal. Totally terrific. This will also ensure an infant doesn’t get to play or eat the cat’s waste. You know how babies love eating anything. Oh, and your dog is safe too. 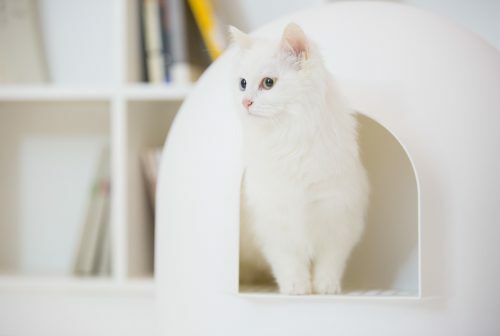 The Igloo Litter Box is fitted with a long grid toward the exit. I noticed Missy gets to wipe off her paws of the litter when she steps on the grid. We don’t have to worry about her messing the white seat covers at all. My sister particularly gets mad when her kitchen is stained. The previous litter box Missy had got her leaving track marks all over the place. Now, I can see that problem solved. We don’t have to keep sweeping the floor to maintain a clean home. All we do is just lift the lid. 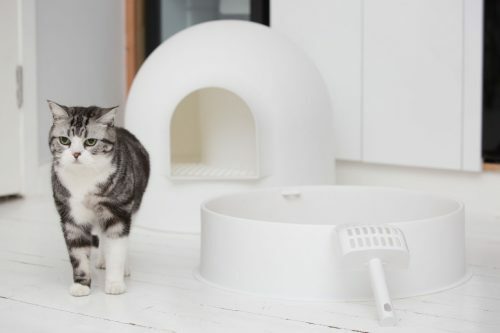 Being a round seamless igloo basin, we don’t have to worry about cleaning the edges like it was with the previous square shaped basic litter box, last time I visited. There is a scoop attached to it at the edge making work a lot easier. The scoop is quite ergonomic actually. Offers an easy and smooth grip. That makes a clean place for Missy. A healthy space. You know what they say around here, “A happy cat makes a happy cat guardian”. The entrance of the litter box is quite wide. Wide enough to let in a large cat like Missy (he he). The easy in and out movement is free of any hindrances. The design allows sufficient ventilation for the cat. Movement of fresh air in and out of the box is very crucial. The spherical design also allows in more light into the space. It is made of long lasting quality materials. The litter box feels sturdier and at the same time has a light feel. Above all, it is enforced with IONPURE which is an antimicrobial technology that is used as a safety measure for babies and children. See how well protected our Missy is? From the research I have gathered about the igloo litter boxes, it seems they can be used by all cats irrespective of size, age or species. Cats love the Igloo Litter Box! You should see how cute Missy looks when she naps on the grind entrance. It makes you think of a self-contained cat structure added to this design. Like, what if it had a fluffy sleeping pad extension next to the entrance. Then probably a scratcher lounge attached somewhere. Like a full house fit for a fantastic cat. A model design to incorporate all that a cat needs. See, this design makes you dig into your imagination. 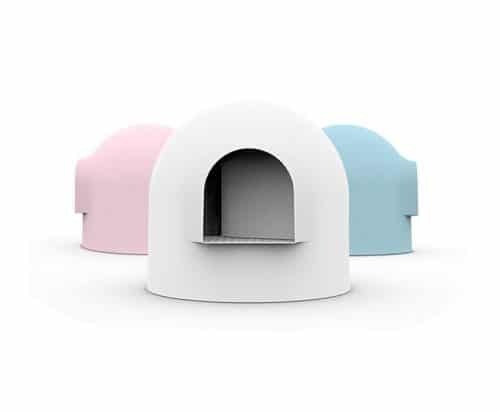 The igloo cat litter box is designed by Pidan Studio and available for purchase on MeetIDEA (http://www.meetidea.com/houseware/igloo-cat-litter-box.html). We definitely need this cat litter box in my hometown. It makes me feel so inspired. One, to warm up to the idea of keeping a cat myself. It looks easy with this design. Secondly, to start an Igloo cat litter box entrepreneurial venture. Based on its efficiency in serving its purpose, it will make a quick-sale product. Dear Igloo Cat Litter Box, the cats in my little hometown definitely need you. 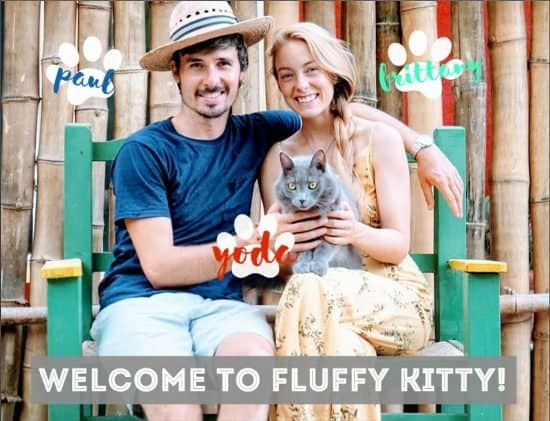 Hi Fluffy Kitty readers! Brittany here – we hope you enjoyed Breezer’s take on the Igloo Litter Box. Let us know your thoughts below in the comment section. Or reach out to us by email if you have any questions! 🙂 See our other articles on the best cat litter box furniture. Next Post Why Does My Cat Have Scabs?